As someone who continues to feel, against the better judgement of price - that the market is in the throes of a terminal move - it has become almost the theatre of the absurb. And so it goes, more questions than answers really. My confidence in market expectations continue to be bifurcated and sliced, like a cadaver - six months worked through by over ambitious first year med students eager to connect the dots. Student: "Yes Professor, I can see the circulatory system. The heart, the vessels - the physiological framework." Professor: "But how are things correlated to his death - what caused it?" Perhaps our patient isn't terminal after all. 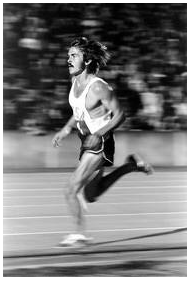 They are certainly pumping bolus infusions of liquidity into the global circulatory system, as evidenced in the once ailing equity patients now sprinting sub 5 minute mile's with the reckless abandonment of the late, great Steve Prefontaine. So why is gold and silver, and the broader commodity complex in general - behaving so poorly in an environment inundated with easing(s) and the constant almost daily ruminations of QE(x)? It seems for many of the purchasers of these hard assets, that was the rationale and attraction to own them in the first place, no? Before I take a shot at this, I would be fooling myself without acknowledging that perhaps I am distilling a situation that is far more complicated than my thesis presents. Although I am constantly reminded that the purported experts on various mechanisms for asset movements - since these troubles (circa 1998) began, have often been wrong in both causation and timing. It's wise to remember if you swim in these waters long enough, don't forget to acknowledge lady luck as well. She's sometimes your best friend and at other times a cruel mistress of misfortune. Of course you never really know by walking beside her - she smile's just the same. So with that said, and considering the currency and commodity markets have for the most part acted within my understanding of their respective anatomies, I am waiting as a thesis is tested; of which, a critical part is being scrutinized as our domestic equity markets continue to outperform by a very wide margin, what was once the stalwart of the reflationary moves off both the 2002 and 2009 lows - the precious metals and commodity (CRB) markets. As mentioned before in my previous notes, I utilize ratio charts as another dimension in appraising where a market stands. For this particular thought I continue to lean heavily on the silver:gold and the CRB:SPX ratios. The basic premise being that the interventions by the Fed and Treasury - since 2002, put considerable pressures on an overvalued U.S. currency, which in turn contributed to the reflationary rebound in our equity markets and the reemergence of precious metals and commodities as a performing asset class.These ratios have also in the past provided guidance as to when risk ebbs and flows within the markets. Generally speaking since the bulls' started snorting in 2002, when silver outperforms gold - risk is being taken on by traders in size. Certainly there is more motivational nuance to the story for both the equity and commodity markets - from historically low interest rates to the emergence of large developing economies such as the BRIC's. 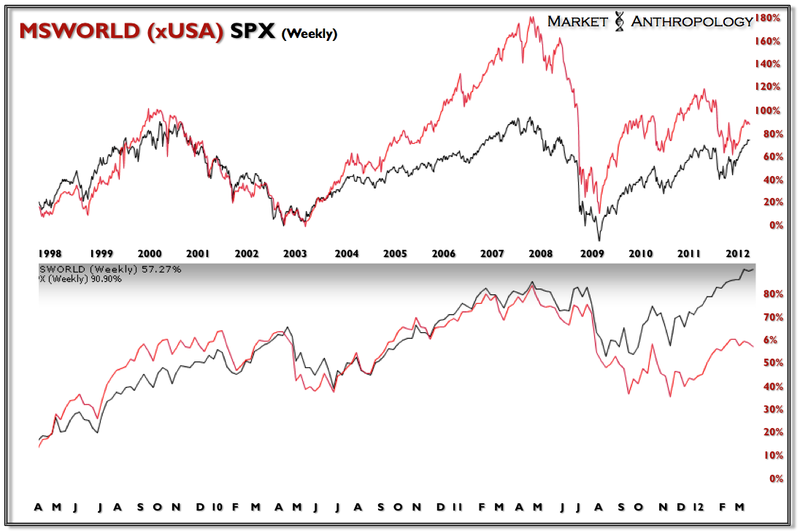 Both of these reasons have been sited by the bulls as strong underpinnings of the cyclical bull markets in equities (2002-2007 & 2009-Today) and the secular bull market in precious metals and commodities (2002-2011?). Can the U.S markets decouple from the world as it appears to be going into a slowdown? As mentioned last year in my Constructive Interference Theory, world growth is now more than ever - synchronized. For better (the last 30 years) and for worst, we carry each other through the cycle. This is exemplified by a statistic from RBC last week which observes that "the rolling five-year correlation of 32 countries GDP's have been on the rise and presently stand at over 90% - Barron's" (H/T ukarlewitz). So while the equity markets have enjoyed a respite from the correlation strangle they found themselves in last year, economic growth is still very much aligned. As noted in the chart below, we are currently experiencing the inverse dynamic of the downturn that began at the end of 2007. At that time it was our own economic growth that began to turn down before the world economy caught fire. This time around, the world indices have been diverging from our own markets performance since last year. Considering growth has very much been tied to the commodity boom in the emerging economies of the BRIC's - it is hard to see that well being replenished as the commodity index continues to slump. As noted last year in April - the CRB index appeared to be completing the final retracement rally of a very broad head and shoulders top. Since then, the MSWORLD index has also followed that same arc. This has also coincided with the downturn in the euro, the silver:gold ratio and the precious metals market in general. You could make the argument that our markets on a relative performance basis have just been playing catch up to the overshoot of the last crisis. So can the Bernanke Put avoid a similar fate of his predecessor's psychological control over the markets? I doubt it. The funny thing about moral hazard is the lesson eventually gets taught when global growth stalls. In this version - Godot actually shows up.